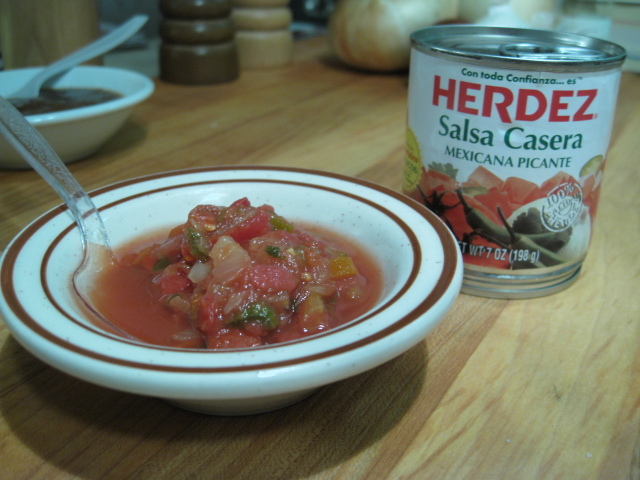 Salsa Casera is very similar to a pico de gallo mix. Chunky veggies in a thin “juice”, it can be a base for a quick home-made salsa dip, or used as a topping on tacos. Available in “hot”, “medium” or “mild”. 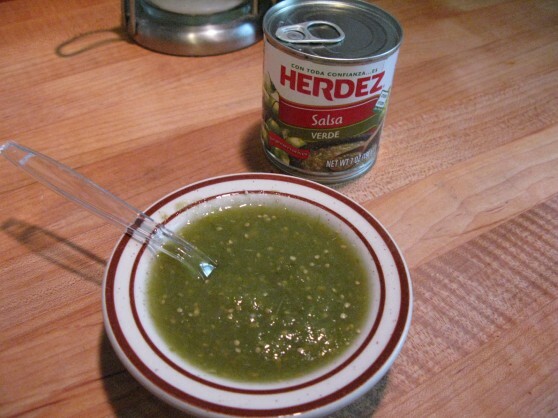 This bright green sauce gets its flavor from the tomatillos (Mexican green tomatoes) – it’s very thin, and uniquely tasting as a classic “verde” sauce. 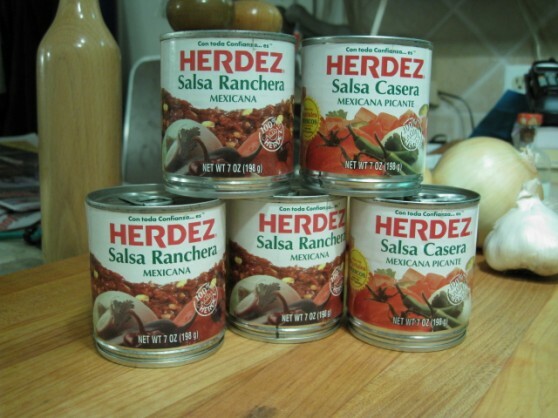 Great on enchilladas or as a fresh dip mixed with mayo. This is my favorite of the Herdez line-up! Very dark, smokey with a nice medium coarse texture due to the puree method of blending all the ingredients. I love this on tacos or nachos, or just to dip chips into. 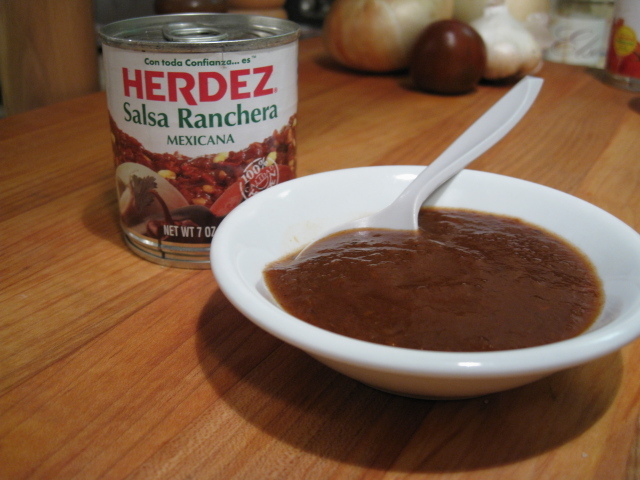 Herdez also recommends trying this sauce as a spicy substitute for BBQ sauce. Gotta try that. In addition to the 7 oz. cans pictured here, Herdez offers these salsas and a few other flavors in 16 oz glass bottles. I have tried the Salsa Chipotle… it was very disappointing… too thin, with some off-putting aftertaste… and very little smokey chipotle heat. Just not their best sauce. Visit the Herdez Traditions website for more info about these and their other fine products. I was surprised to see that they are also behind the awesome Bufalo Brand of hot sauces! Ironically, I love the Bufalo Chipotle hot sauce… just not the Salsa Chipotle mentioned above. Go figure. Are any of these actually hot, even the “hot” Casera? The prevalence of Serrano pepper (it’s a 15-20,000 SHU pepper after all) is suggestive, but unfortunately not conclusive. The Ranchera is quite hot… I’d say 1-10 it’s about 6. I purposely didn’t include heat ranges on these as they are all on the milder side, and my numbers would be very subjective. I have a can of the verde on hand right now. I love their stuff but the verde is my favorite, it’s perfect with eggs, breakfast burritos and such. I put the salsa casera in a blender with a little extra onion and cilantro and it blends into a perfect taqueria style chip salsa. Delicious! That’s a great idea. Thanks Nelly.